The second picture shows the placement of a spark gap electrode. It is used to prevent overvoltage on the device being tested. These are two large Leyden jars constructed from a plastic trashcan and a discarded cheese ball jar. Each could only be charged for about 2 minutes. A charge of 4 minutes caused dielectric failure ("punch through") accompanied by a loud firecracker-like explosion. They could stay charged for at least several minutes after the generator was shut off. Note that the foil does not go all the way to the top of the containers. This generous gap is necessary to prevent flashover. This is a discharge wand with a 2 foot PVC handle. 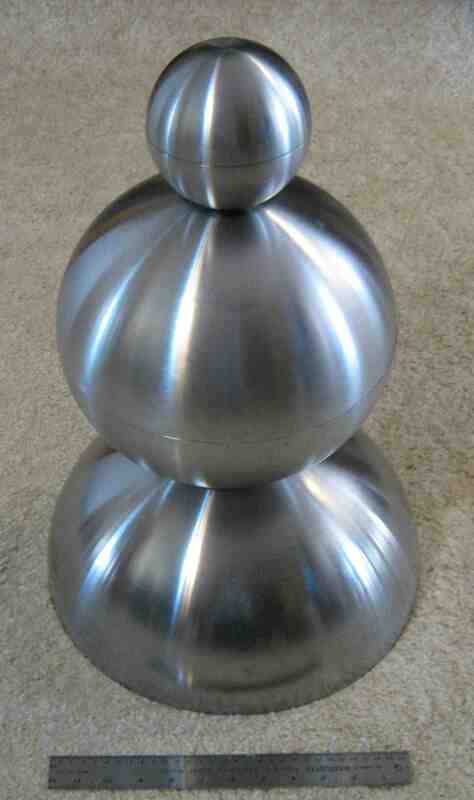 It is made from 1/4" steel rod and two Baoding balls (finger exercise balls) that I got at an oriental food store. I drilled and tapped the balls for the rod. A bolt with two flat washers and two split lock washers (for tension) allows the spherical tips to be adjusted as required. The bolt goes through an eye screw which is epoxied into the handle. During use, one ball is touched to the generator ground and the other is brought near the high voltage terminal. When connected to a Leyden jar, the high voltage terminal discharges with a very loud, thick, bright, long spark. This shows dielectric breakdown ("punch through") at the bottom of the trash can and at the side of cheese ball container. Ordinary aluminum foil was used in the construction. Breakdown punches a neat pinhole in the plastic and blows back the foil. These holes were later plugged with Silicone I sealant, and normal operation was restored. This shows the placement of foil (aluminum flashing) on a tube-within-a-tube PVC pipe capacitor. Normally a tube capacitor could be constructed with one tube, with foil on the inside and foil on the outside. But this one was intended to use distilled water as the dielectric. The water will go into the annulus formed when the 1.5 inch pipe is placed inside the 2 inch pipe. Note that thin wall PVC pipe was used in this case. This shows arc-over tracks from surface corona discharge. The aluminum flashing electrodes had to be cut back about 4 inches (both inside and outside) to prevent flashover in air at 200,000 volts. The dielectric stress at the ends of the foil is very high and could be reduced by using Rogowski profiles at foil ends. Lacking that, even corona rings would help. Another alternative is to use semiconductive tapes or coatings containing zinc oxide, silicon carbide, blotting paper treated with copper sulfate, "corona dope", etc. Corona and arc-over eventually destroy capacitors, and also interfere with charging. High voltage end of the capacitor tube. 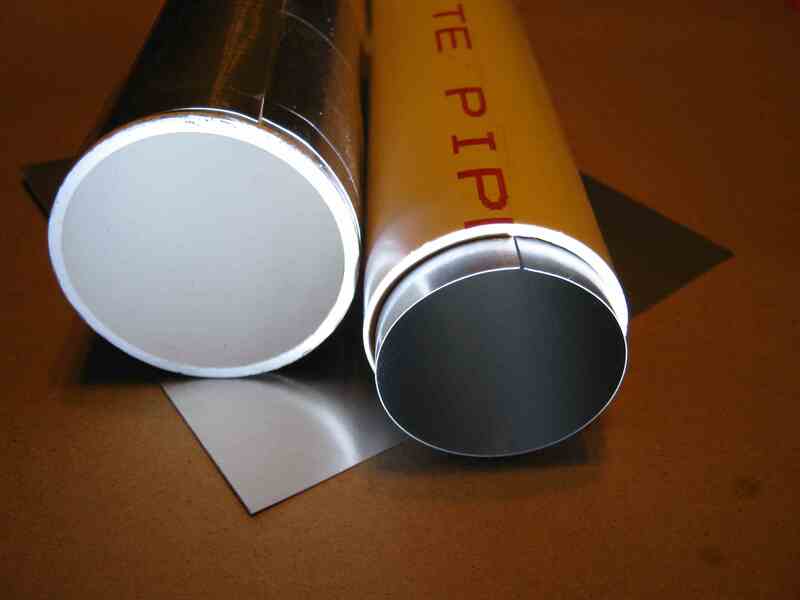 The outer foil (aluminum flashing) is at ground potential. The inner electrode connector is a stainless steel scouring pad epoxied to a bamboo stick and is threaded with #16 AWG wire. It connects with the innermost cylindrical electrode of aluminum flashing. The distilled water goes into the annulus between the two pipes. The epoxy coated paper centering ring is used during dry testing and construction. The thick insulation on the high voltage wire is made from three different diameters of vinyl tubing, the smaller ones being pulled through the larger ones. This capacitor is being dry tested for flashover (at 200,000 volts) and charging time characterization. It can store a dangerous amount of energy even with air/PVC as the dielectric. This shows the scheme for sealing the inner pipe within the outer pipe and the passthrough for the water fill tubes. The brown rings are made from epoxy coated Kraft wrapping paper. The large ones are cemented to the pipe with expoy (the 6 minute kind) and the narrow ones are movable. The water fill tube is pressed against the capacitor tube with tape and then epoxied. The tape is later removed. The helical wrapping of the water tube keeps the inner dielectric pipe centered within the outer pipe. For final sealing, the inner dielectric pipe assembly is slid into the outer dielectric pipe. The inner pipe is then moved right or left a few inches so that a 1/2" wide layer of Silicone I sealant can be applied first to one end and then to the other. With the ends of both pipes flush, the narrow rings are pushed into the annulus with a suitable tool to compress the sealant and fill any gaps. The water fill tubes are stowed by coiling them in the air gap of the annulus. This shows the completed capacitor. 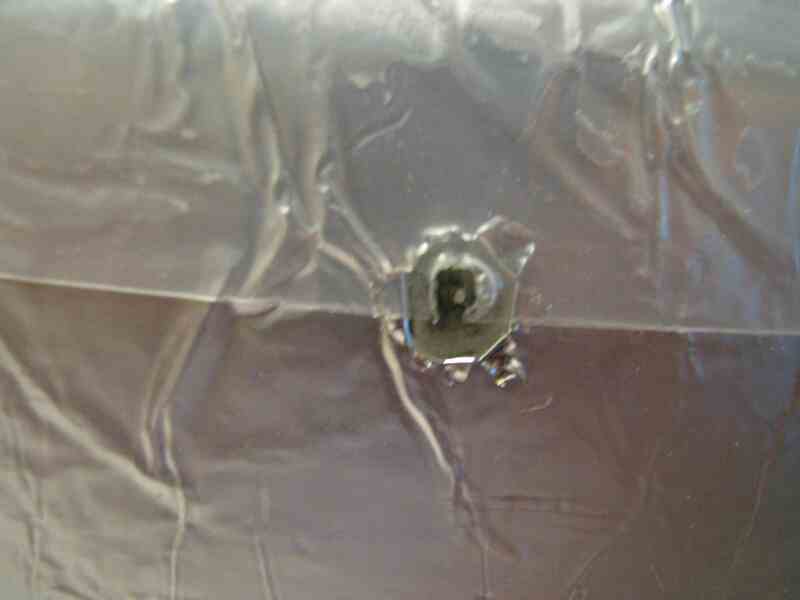 The outer foil (aluminum flashing) and the two copper drain wires are covered with a couple of layers of packaging tape. 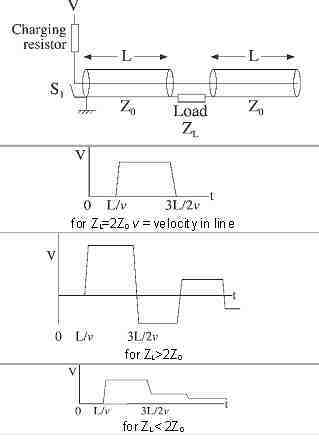 The tests for the capacitor in the vertical position gave the same results as those for the horizontal.. The results were both encouraging and disappointing. The charging time increased by 8 seconds, indicating higher capacitance, as expected. But the increase was disappointingly small. Still, this was my first experience with a water capacitor. The fact that it has any capacitance after the water was added was encouraging. The device did not leak either, nor flash over, which means that the construction methods are valid, at least for the stated spark gap setting. In subsequent tests, a Spark Gap setting of 62 mm gave a charging time of 65 seconds, and an SG setting of 70 mm gave about 78 seconds. In the latter case, corona losses at the generator were becoming significant and caused some scatter in the data. A 2.75 inch Spark Gap appears to be roughly the limit of this set up. If the dielectric strength of air is taken as 3 kV/mm, that works out to be about 210 kV. (http://en.wikipedia.org/wiki/Dielectric_strength ) A current of 5 microamps for 70 seconds transfers 350 microcoulombs of charge. Energy stored in a capacitor is U = 1/2 QV . At 200,000 volts that represents about 35 joules (or enough energy to light a 20 watt fluorescent light bulb for almost 2 seconds). However, that figure is probably high because a Fluke 115 meter shows that the capacitance is less than one nanofarad (which, with U = 1/2 CV2 , would be equivalent to 20 joules; additionally this generator's output is probably more realistically 1-2 microamps). "Water is a rather important dielectric liquid in pulsed-power applications. It has a relatively high electric breakdown strength (up to 3 x 107 V/m) for submicrosecond electric stress and, owing to its high permittivity, can store quite large energy densities for short times. Most of the electrical characteristics of organic dielectric liquid insulators . . . are also valid for water. A small fraction (10-7) of water molecules is always dissociated into H+ and OH-. These ions lead to a residual conductivity of 4 x 10-6 S/m even for very clean water. Therefore water is inadequate for DC-insulation. . . . Nevertheless, ionic currents do not contribute to the initiation of breakdown for submicrosecond pulses. This has been demonstrated even for salt solutions with concentrations up to 1M. . . . Water, which is largely used in short-pulse applications, has, in addition, the benefit of a high dielectric constant (e= 81), which allows one to store high energy densities. Other schemes use a peaking capacitor. The Marx generator, with its long chain of spark gaps and simply its overall size, has a fairly high inductance (a few microheneries ), which is difficult to reduce because of the extremely high voltage gradients. A properly constructed peaking capacitor, along with another spark gap switch, can reduce this to a few nanoheneries, which in turn enables rise times of only a few nanoseconds. Some applications, such as flash radiography of exploding materials (as in atomic weapons research), require these high power, ultrashort pulses. Barium titanate is another common high k material (k of 1250–10,000). I tried making a high voltage capacitor by using it, paraffin wax, computer printer paper, and four copper foil plates. It was a complete failure. I could not even get it to charge. Apparently, there was some sort of internal leakage, but I did not have a gigohm meter (examples) handy to investigate. At 200,000 volts even a megohm is considered very conducting (do the math). A good insulator would be above 10 teraohms at a minimum. 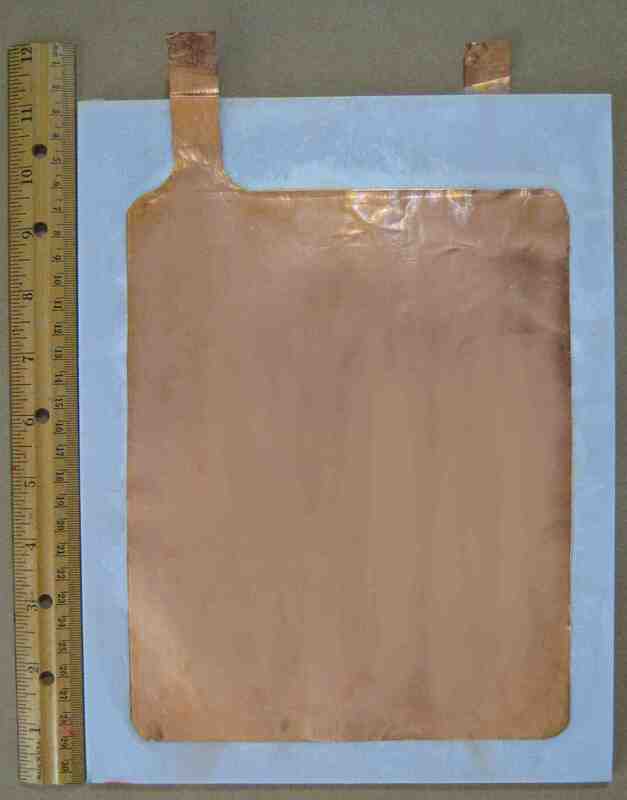 In the photo of the disassembled capacitor shown at right, the two copper plates are separated by a stack of fused waxed paper about 6 mm thick. Notice the extra border needed when tabs are brought out. The resistance could not be measured with a Fluke 115, and so it is greater than 40 megohms (as measured with low voltage). A stack of lead plates, paper index cards, and paraffin wax was to be used in a test of Brown's massive cellular gravitator. But because of the previous failure with paper and paraffin, the experiment was postponed indefinitely. However, Brown has suggested that a slightly conducting ("semiconducting") dielectric in this kind of application might have an advantage over a perfectly insulating one. 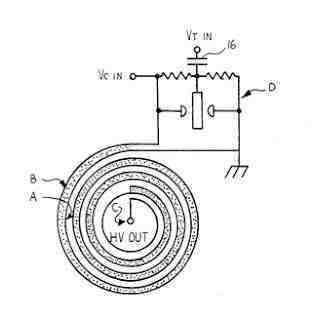 This is a tubular asymmetric capacitor similar to one described in Brown's patents. It is suspended from two pink nylon strings. The inner tube is filled with white barium titanate and bees wax. The outer one is filled with paraffin. 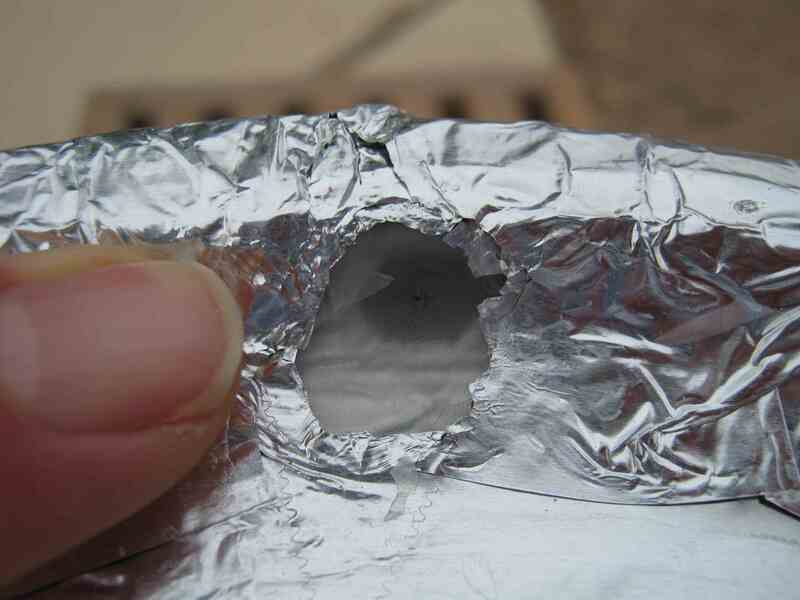 The outside is wrapped with aluminum foil and serves as the negative electrode. The wire down the center is in contact, asymmetrically, with the barium titanate/wax mixture. Upon application of a 100,000 volt DC pulse, the assembly is expected to move in the direction of the ruler. Compare this with Naudin's Poynting Flow Thruster (PFT, http://jnaudin.free.fr/html/pft01.htm ) His remarks on this are similar to mine . "Electric Flying Machines: Thomas Townsend Brown", Gerry Vassilatos, http://borderlandresearch.com/book/lost-science/electric-flying-machines-thomas-townsend-brown/1 (This interesting article is split-up into 25 pages on the web. Note the references to repetively pulsed high voltage power (often omitted in descriptions of these experiments). This is important. The mysterious "black band" or "dark streamer" effect is also described. Further, the strange "dematerialization" effect referred to, might actually be a "delocalization" effect. Perhaps the distinction will prove to be moot, but "dematerialization" means that the object and its constituent matter are destroyed; "delocalization", on the other hand, does not actually destroy the object, but means its constituents become "non-local" or "non-contiguous" in the reference system. It might be possible to reconstitute such an object. (cf. Spheres for testing the Piggott arrangement can be assembled from stainless steel serving bowls (Ikea 5", 11" and 14" shown) See http://www.ikea.com/us/en/catalog/products/50057254/#/00057256 Upper roller assembly mounted inside 14" bowl. http://amasci.com/freenrg/morton1.html , http://amasci.com/freenrg/mort2.txt http://groups.google.com/group/sci.physics.relativity/browse_frm/thread/25991020eef22a11 . . .
"Conquest of Gravity Aim of Top Scientists in U.S.", New York Herald-Tribune, Sunday, November 20, 1955, http://www.bibliotecapleyades.net/ciencia/secret_projects/project048.htm . Interest in machines that can produce short pulses of millions of volts at 100,000 amps for tens of nanoseconds has grown considerably in the last few years. The related design literature is very specialized, hard to find, and expensive. Some of the following references could be helpful. However, I suggest reviewing the various (free) .pdf files first, especially those from Kumamoto University (Japan) and Scandinavia and Germany. Additionally, some of the books occasionally become available used, still in good condition and at considerable discounts. Interlibrary Loan services at your local library, even in small towns, can also be helpful for getting a copy into your hands. Perhaps even better is electronic access thru a local library account which will often have EBSCO Host or some sort of academic search facility listed under a "General Research" category. Often you can use these by logging in online, but a few require you to actually be at the library. Most of these articles are very technical, or specialized, and beyond the scope of this presentation. Only a few have been included below. "Commercial Pulsed Power Applications in Germany", Markus J. Loeffler,. 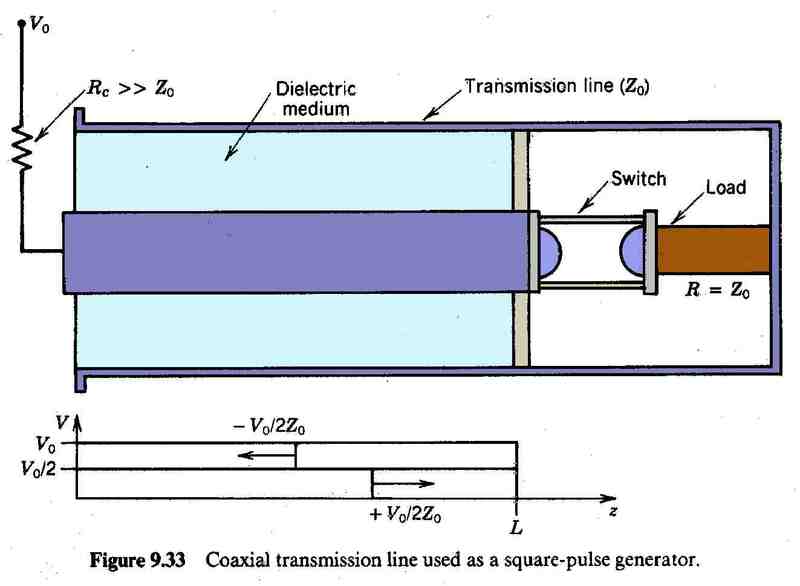 "250 kV Sub-nanosecond Pulse Generator with Adjustable Pulse-width", Tammo Heeren, J. Thomas Camp, Juergen F. Kolb, Karl H. Schoenbach, Sunao Katsuki, Hidenori Akiyama (2010) http://ee.cqu.edu.cn/myweb/upfile/20100308174223990.pdf "The pulse rise-time can be adjusted by manipulation of a peaking gap, whereas the pulse-width can be changed by adjusting a novel tail-cut switch located close to the load." In electronics, a step recovery diode (SRD) is a semiconductor junction diode having the ability to generate extremely short pulses. It is also called snap-off diode or charge-storage diode or memory varactor, and has a variety of uses in microwave electronics as pulse generator or parametric amplifier. When diodes switch from forward conduction to reverse cut-off, a reverse current flows briefly as stored charge is removed. It is the abruptness with which this reverse current ceases which characterises the step recovery diode. The Drift Step Recovery Diode (DSRD) was discovered by Russian scientists in 1981 (Grekhov et al., 1981). The principle of the DSRD operation is similar to the SRD, with one essential difference - the forward pumping current should be pulsed, not continuous, because drift diodes function with slow carriers. The principle of DSRD operation can be explained as follows: A short pulse of current is applied in the forward direction of the DSRD effectively "pumping" the P-N junction, or in other words, “charging” the P-N junction capacitively. When the current direction reverses, the accumulated charges are removed from the base region. As soon as the accumulated charge decreases to zero, the diode opens rapidly. A high voltage spike can appear due to the self-induction of the diode circuit. The larger the commutation current and the shorter the transition from forward to reverse conduction, the higher the pulse amplitude and efficiency of the pulse generator (Kardo-Sysoev et al., 1997). attached to the right side. The center plate is charged to 20 kV and the outside plates are grounded. MOGUL Blumlein 3.8 Megavolt flash X-ray pulse generator ( "the dimensions of this thing gives new meaning to the term 'transmission line' " ! -BF) http://books.google.com/books?id=9ORb4YQ6rlYC&pg=PA11&lpg=PA11&dq=Mogul+Blumlein&source=. . .
"Rise time reduction in high-voltage pulse transformers using auxiliary windings"
used for testing equipment used in 220,000 volt power transmission grids. no Nylon, Forvar, Teflon insulation back in those days. Wave Erection Marx Generator ( http://www.apelc.com/ ) Below is a list of article links copied from the Applied Physical Electronics L.C. site. They are all instructive but only some apply strictly to Marx generators. "Compact Flash X-Ray For Radiographic Applications," J.R. Mayes (2006) http://www.apelc.com/pdfs/1.pdf "Designing the stray elements into the overall design can lead to a “wave erection”, in which an electromagnetic wave efficiently propagates the Marx circuit as the switches sequentially close. As a result, ultra fast rise times and high load voltage efficiencies can result." "An Enhanced MV Marx Generator for RF and Flash X-ray Systems," J.R. Mayes, M.B. Lara, M.G. Mayes & C.W. Hatfield (2005) http://www.apelc.com/pdfs/3.pdf "Wave erection is made possible through the proper design of the stray capacitance and the interstage capacitance, in concert with coupling the spark gaps via ultra-violet energy. Rise times from a few hundred ps to several ns result with proper stray element design. " "Compact Marx Generators for the Generation of High Power Microwaves," J.R. Mayes, W.J. Carey, W.C. Nunnally, L. Altgibers, & M. Kristiansen (2001) http://www.apelc.com/pdfs/15.pdf "This paper discusses two very compact Marx generators capable of delivering voltage pulses of several hundred kV, durations of several nano-seconds to 10’s of nanoseconds, and risetimes as fast as 200 ps." "The magnetic arc gap was capable of handling the large currents required by Tesla. In achieving powerful, sudden impulses of one polarity, these were the most durable. Horn shaped electrodes were positioned with a powerful permanent magnetic field. Placed at right angles to the arc itself, the currents which suddenly formed in this magnetic space were accelerated along the horns until they were extinguished. Rapidly extinguished! 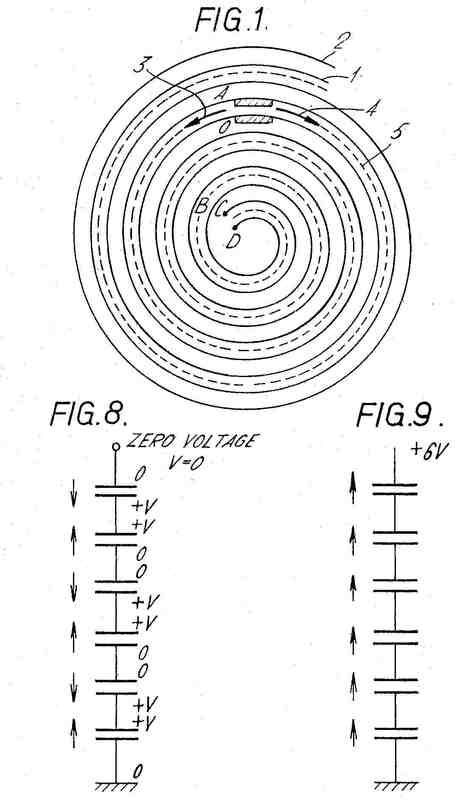 Arcs were thus completely extinguished within a specified time increment Tesla configured the circuit parameters so as to prevent capacitor alternations from occurring through the arc space. Each arc discharge represented a pure unidirectional impulse of very great power. No “contaminating current reversals” were possible or permissible." The emphasis in these devices is to achieve very high peak power.levels, with pulse lengths on the order of a few 10’s of nanoseconds, peak currents of up to 10’s of MA, and accelerating potentials of up to 10’s of MV. New high average power systems, incorporating thermal management techniques, are enabling the potential use of high peak power technology in a number of diverse industrial application areas such as materials processing, food processing, stack gas cleanup, and the destruction of organic contaminants. These systems employ semiconductor and saturable magnetic switches to achieve short pulse durations that can then be added to efficiently give MV accelerating potentials while delivering average power levels of a few 100’s of kilowatts to perhaps many megawatts. Magnetic Pulse Compression (MPC) utilizes reactors (L1, L2, L3…) in conjunction with capacitors (C1,CL2,CL3…) to shape input pulses into narrow output pulses of much higher current (See figure 3 & 4). The MPC, therefore, allows the designer to use less expensive input switches with lower current ratings. MPC can also extend the lifetime of the input switch. Advanced MPC devices - capable of generating power levels of multi-terawatts in tens of nanoseconds - have been realized utilizing Metglas� cores. "The technique of magnetic pulse compression, also called pulse sharpening, has been known and successfully applied for some time. 7-11 A typical application consists of one or more stages of discrete lumped LC lowpass filters forming a delay .- line as shown in Figure 2. The inductor is designed to magnetically saturate sometime during the leading edge of the drive pulse. The network then “switches” from longer to shorter delay time, which can be made to speed up the leading edge of the transmitted pulse. The later portions of the edge travel faster and “catch up” to the earlier portions somewhat as a water wave steepens in running over a sloping sea bottom. Cascading stages can yield remarkable results with nanosecond risetimes to 50,000 V being reported.8,11 Theoretical limits on risetimes of 40 ps per inductance element have been calculated based on the spin relaxation rates in ideal ferrites. When stray reactances in coupled circuits are taken into account this risetime degrades to nanoseconds. A related design is the ferrite-loaded coaxial line,10,11 also reported to achieve significant pulse leading edge sharpening. This geometry is basically just a distributed circuit version of the lumped design and operates by the same principles." [Abstract] A design approach giving the optimum number of stages in a magnetic pulse compression circuit and gain per stage is given. The limitation on the maximum gain per stage is discussed. The total system volume minimization is done by considering the energy storage capacitor volume and magnetic core volume at each stage. At the end of this paper, the design of a magnetic pulse compression based linear induction accelerator of 200kV, 5kA, and 100nswith a repetition rate of 100Hz is discussed with its experimental results. Note that while each stages capacitor value decreases from that of its predecessor, the voltage across it will be twice that of its neighbor upstream. In the case of Figure 2, each inductor core is actually used as a saturating inductor. That is, when the capacitor to the left of it is fully charged, the energy from that capacitor is dumped into the inductor. As the inductor stores more and more energy, it eventually saturates, allowing its energy to cascade into the next capacitor downstream, and so on. "Pulse conditioning systems are being used to generate fast rising electromagnetic fields in the 10s of gigawatt power range. . . . The switching element is a major component of any power conditioning system and, for UWB [Ultra Wide Band] high power electromagnetic field generation, ultrafast closing capability, along with fast voltage recovery are desired. A fast pulse risetime is critical because the risetime contains the high frequency components of the resulting spectrum. 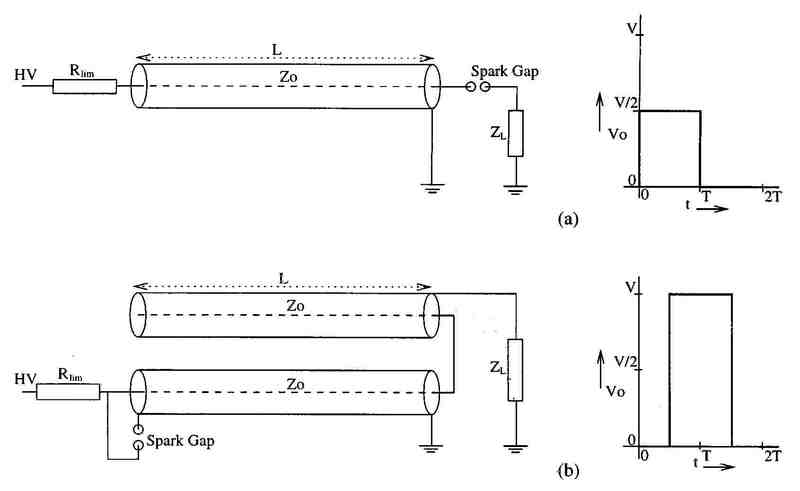 To sharpen the rise time on a pulse, a spark gap configuration, called a peaking gap is use. 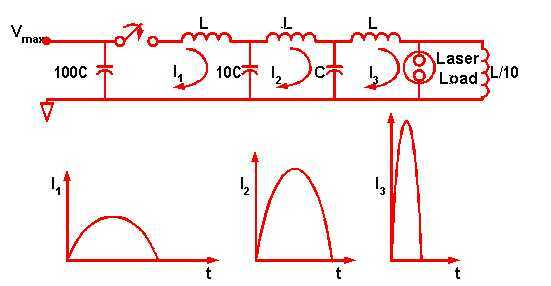 The crux of the peaking gap is the establishment of very high electric fields in the interelectrode spacing. The velocity of propagation of the electron avalanche is proportional to the electric field applied to electrodes, and thus, gap closure is dominated by the applied electric field. To produce ultrafast switching, the spark gap is dramatically overvolted; that is the spark gap is charged far in excess of its self-breakdown voltage. Peaking gaps typically operate at gas pressures in the range of 100 atm and electric fields in the MV/cm range. The self breakdown curve for gases is known to saturate in the vicinity of 100 MV/m for pressures to 50 atm. To achieve overvolting without switching at the self breakdown voltage, the spark gap is pulse charged very quickly. This allows a large overvoltage to be achieved, and overvoltages of over 300% are achievable. . . . Spark channel inductances of less than 1 nH have been achieved with gap lengths of 1 mm and less. . . . These small interelectrode distances, however, yield high spark gap capacitances, even for relatively small diameter electrodes. Moreover, this high spark gap capacitance , and the fast charging times lead to a strong displacement current which manifests as an undesirable prepulse on the load voltage. . . . Since a fast charge is critical to peaking gap operation, small diameter electrodes are desirable. Moreover minimizing the electrode diameter of the peaking gap may lead to enhanced performance. The generation of 50 ps ristime pulse with a 60kV charge in a single channel switch of very small dimensions has been reported." 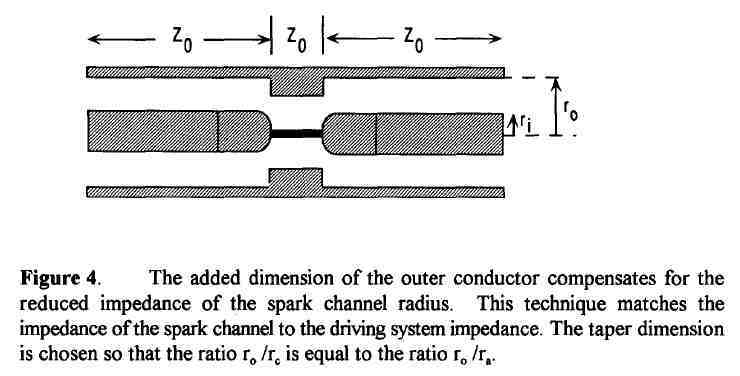 "The purpose of this taper is to match the impedance of the spark channel to the driving system impedance and hence, matches the inductance per unit length of the hardware to the inductance per unit length of the interelectrode gap region. As shown in Figure 4, the sharp edges introduce additional field enhancement to the spark gap design. A practical design contours both the inner conductor and the outer conductor to maintain a constant impedance as well as the voltage holdoff throughout the switch. " "Repetitive switching employing corona stabilisation is an effective method for achieving higher PRF operation. Relatively simple designs are available for the self-closing and triggered modes of operation. The self-closing version of these switches has demonstrated good repetitive performance with lifetime capability in excess of 108 [108 ?]shots. The triggered version has shown reliable operation at a PRF of up to 20 kHz. 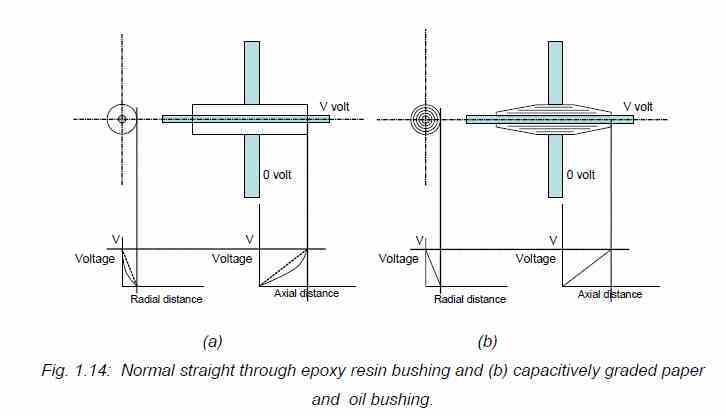 The present work has indicated that by selecting the correct electrode geometry and material, it is possible to use corona stabilised switches to achieve performances similar to that of thyratrons at a fraction of the cost"
"Corona-stabilised plasma closing switches, filled with electronegative gases such as SF6 and air, have been used in pulsed-power applications as repetitive switching devices for the last 10 years. Their high repetition-rate capabilities coupled with their relatively simple design and construction have made them suitable alternatives to thyratrons and semi-conductor switches. As well as having repetitive switching capabilities, corona stabilised plasma closing switches have the potential to operate at elevated voltages through the incorporation of multiple electrode sets. This allows high-voltage operation with inherent voltage grading between the electrodes. A further feature of such switches is that they can have relatively low jitter under triggered condition." Abstract: In 1991 we discovered a semiconductor opening switch (SOS) effect that occurs at a current density of up to 60 kA/cm2. The discovery of the effect provided a basis for the development of an opening switch with a gigawatt level of pulsed power, with an interrupted current of scores of kilo amperes, with a voltage of up to 0.5 MV, and with a current interruption time of 10 to 50 ns. Subsequent to those experiments, we developed a new circuitry ideology of constructing repetitive megavolt generators and accelerators with an all-solid-state switching system. In this approach, the SOS performs the function of a terminal power amplifier, by transforming the microsecond pumping pulse into a nanosecond output pulse. Significantly, the thyristor transformer delivers power to the SOS via an intermediate magnetic compressor. We present results of theoretical and experimental investigations of the SOS effect and describe the circuits and design of accelerators developed on the basis of it. A substantial increase in pulse power and in voltage for semiconductor opening switches was achieved after the discovery, in 1991 of the SOS effect - a nanosecond cutoff of superdense currents in semiconductors . . . SOS diodes have been developed which are nanosecond, solid-state switches intended for interruption of high-density currents. They have an operating voltage of some hundreds of kilovolts and are capable of switching several gigawatts of power and interrupting a current of a few or some tens of kiloamps at kilohertz pulse repetion rates. 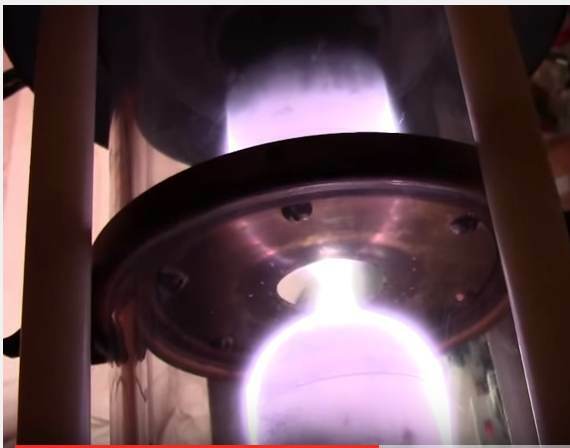 "The pseudospark is a low pressure, hollow-cathode gas discharge that occurs in a special discharge geometry (pseudospark chamber) in different kinds of gases. A modular pseudospark chamber was built to investigate this new discharge type as a source of intense electron beams. At a breakdown voltage of 24 kV and a discharge current of 480 A, an electron beam of 10G A and 13 ns FWHM was extracted through the anode hole into a drift chamber filled with low pressure gas. Electrical parameters of the circuit, including the plasma channel, were evaluated by monitoring the discharge current waveform. First results of beam profile and emittance measurements of the produced electron beam are presented. At an axial distance of 9 cm behind the anode an runs emittance of 5.5 mm-mrad was measured. " "Recent research has produced a new generation of gas-phase plasma switches that are characterized by very high current emission and conduction while operating in a glow mode. These switches include the pseudospark and the BLT, both of which have hollow electrodes, switch over 10 to 100 kA peak current, and have cathodes with emission ~ 10,000 Ncm2 over ~ 1 cm2 area. The cathode properties are especially remarkable - about 2 orders of magnitude larger emission than existing thermionic cathodes. (Preface)"
"There is a need for high voltage, high current, compact pulsed power sources at the 500 kV, 10 kA, and 500 ns parameter level. Few switches can handle such parameters with any reliability. We have taken two distinct approaches to such a compact pulse generator system. The first is based on the development of a multigap, 200 kV rated Pseudospark switch and Transmission Line Transformers , and the other, which we present here, is the Marx generator. Switches in Marx generators need to hold off only a single stage voltage. . . .An excellent candidate switch is the Pseudospark [2,3,4,5]. The Pseudospark is a glow discharge switch, capable of operation at 35 kV and 10 kA, having fast (< 30 nS) rise time, small size and relatively low housekeeping power requirement. . . .  Ian D. Smith, “A novel voltage multiplication scheme using transmission lines” Proc. 15th IEEE Power Modulator Symposium, 223-226, (1982). K. Frank, E. Boggasch, J. Christiansen, A. Goertler, W. Hartmann, C. Kozlik, G. Kirkman, C. G. Braun, V. Dominic, M.A. 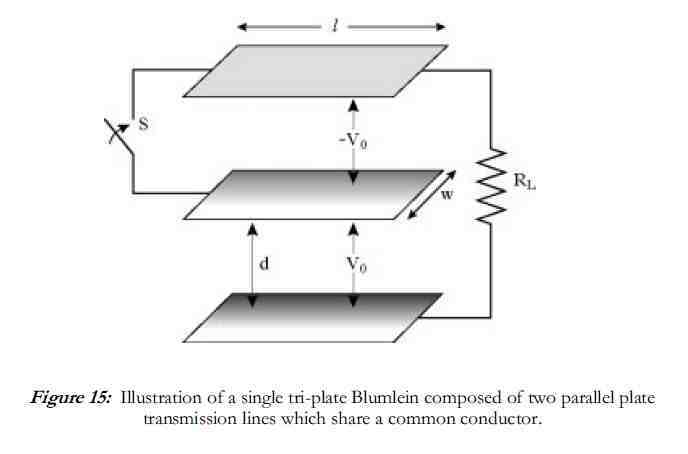 Gundersen, H. Riege and G. Mechtersheimer, "High power pseudospark and BLT switches," IEEE Trans. Plasma Science 16 (2), 317 (1988). "The Physics and Applications of Pseudosparks," NATO ASI Series B 219, Plenum Press (1990)  G. Kirkman-Amemiya, H. Bauer, R. L. Liou, T. Y. Hsu, H. Figueroa, and M. A. Gundersen, "A study of the high-current back-lighted thyratron and pseudospark switch," Proceedings of the Nineteenth Power Modulator Symposium, 254 (1990)." 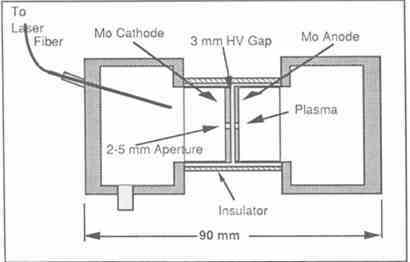 "If a single plane cathode in a glow discharge is replaced by a cathode with some hollow structure such as a cylindrical or slit shaped hole, then, in a specific range of operating conditions the negative glow is found to be inside the hollow structure of the cathode. Under such conditions at a constant current the voltage is found to be lower and, at a constant voltage, the current is found to be orders of magnitude larger than for the plane cathode. This effect is called the hollow cathode effect (Pashen, 1916). . . . These switches allow high current densities with unheated cathodes without the usual erosion associated with an arc. They, therefore, have greater lifetimes than spark gaps under similar conditions." Compact, portable pulsed power: physics and applications. Martin Gundersen, James Dickens and William Nunnally. Available from: https://www.researchgate.net/publication/4062046_Compact_portable_pulsed_power_physics_and_applications [accessed Nov 10, 2016]. "For high voltage, current, μsec pulse, and fast rise, pseudosparks deserve study, engineering and development. The USC-TTU-UMC MURI is working collaboratively to accomplish the first stages of this long range need. The physics, and further applications for the beams, of these devices promises fascinating areas of work with productive applications." Abstract—A repetitive inductive 700-MW high-voltage pulse generator that delivers a 150-ns square pulse with 20-ns rise time at 150 kV has been constructed. The pulse generator has a 1:10 air core transformer connected to a 25-Ω pulse forming line (PFL). 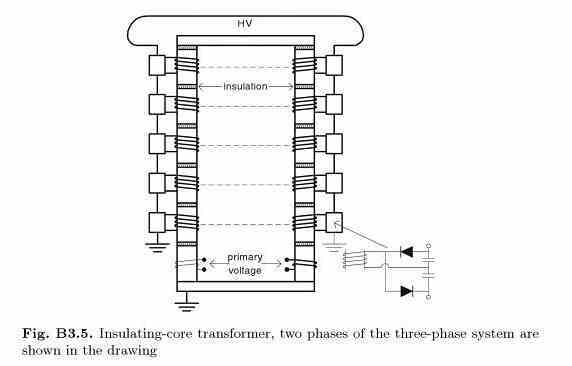 The transformer and the PFL are both constructed using highvoltage cables. 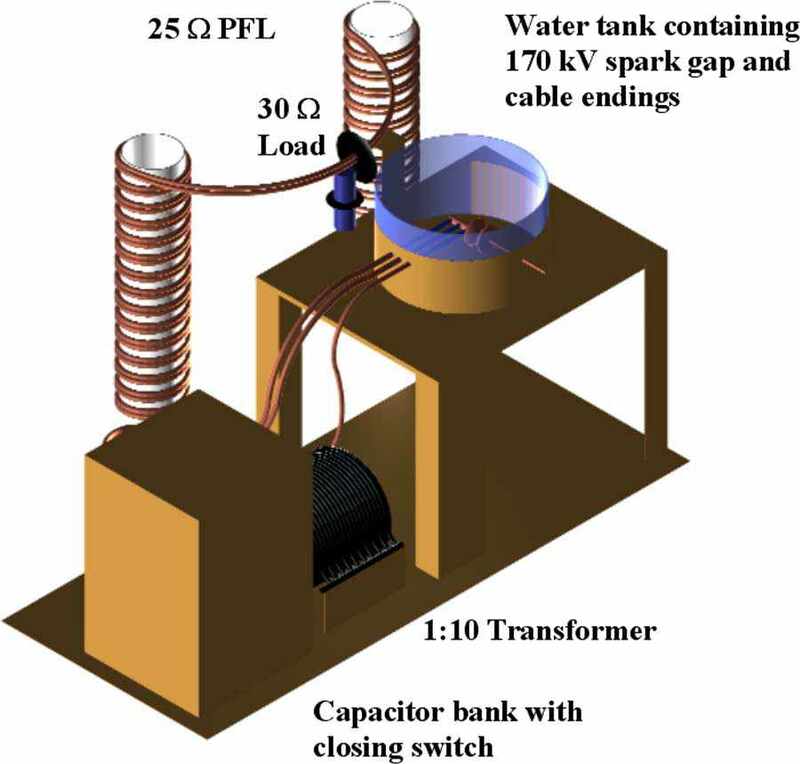 The closing switch of the PFL is a spark gap that is in a water tank together with the cable endings of the PFL and transformer. The electric field at the cable endings is refractively graded by the high permittivity of the surrounding water. The PFL is charged in 2.5 μs to 170 kV, and the electric field in the closing switch of the PFL reaches 33 kV/mm until the threshold voltage is exceeded. The efficiency of the pulse generator is 40%. The authors believe that this concept can be up-scaled to a 25-GW generator operating at 500 kV. 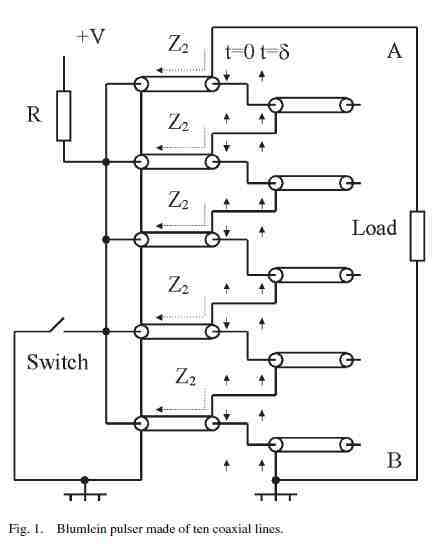 An electric circuit simulation of a 25-GW pulse generator and an electrostatic simulation for a refractive cable ending are presented. It is imperative to design the cable ending or termination of a high-voltage cable with resistive layers properly. The ending must use a stress cone or a geometrical ﬁeld grading in order tocontrol the electric ﬁeld, which by far is the most common method. However, it is possible to use refractive ﬁeld grading as electrical breakdown prevention using a material with high relative permittivity. This type of electric ﬁeld control uses the properties of the media that surround the cable termination. 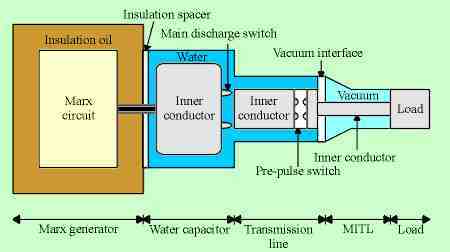 The pulse generator described above has the cable endings from the PFL and transformer terminated in the spark gap. The sparkgap and the cable endings are located in the water tank. . . . This web page started with an experiment. 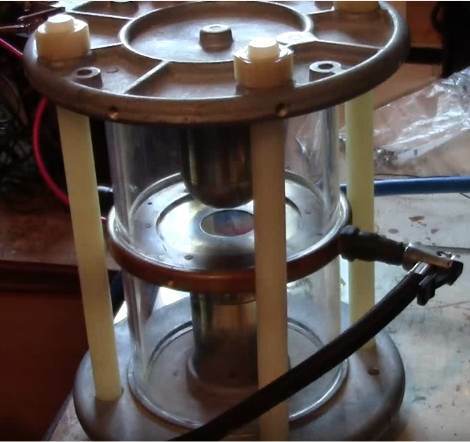 It began with my na�ve attempts at constructing and testing a DC water capacitor. I was not particularly successful in meeting my intended objective. But then I started to learn a lot about pulsed power. That effort lead to fascinating concepts like magnetic insulation, flux excluders, saturable magnetic switches, electrostatic grading, parapotential impedance, e-folding rise times, Blumlein, spiral, and vector inversion generators, surface tracking, Rogowski profiles, growth of metallic whiskers, charge storage annealing, backfiring, prepulse, corona switches, and so on. “. . . started with an experiment . . . . a meter wide 3 meter long mylar insulated DC charged Blumlein generator. . . . It was switched by a hammer-operated blunt tin tack (US usage thumb tack) which was estimated to switch 2 MA [mega-amps] with a rise time of perhaps 5 ns. The objective was to take the 50 kV pulse in the 1/20 of an ohm output line and stack this in a transit time isolated pulse adder and generate a 1 or 2 MV output pulse into a hundred ohms or so. I can well remember the result of the first test. The line was charged with absolutely no trouble and only a little crackling to the full 50kV. Having charged it to the full voltage so easily there seemed to be little point in not firing the machine. There was the usual noise of the hammer hitting the tin tack and, in addition, a sharp crack. About 50 small columns of smoke rose through the freon all round the edge of the lines. Far from being depressed at the apparent failure of our first test, I was delighted that we had accidentally stumbled on a multi channel solid dielectric switch. It is my hope that hobbyists who pursue this science will not be content with just "making sparks" —the adult version of kids playing with matches—but will find applications that are practical and commercial, as well as exploit some truly startling discoveries along the way.